Sort of a sad day for my old man. His 05 Legacy wagon was stolen last weekend. The car was given to him when my grampa passed away last year. The thieves took the car in broad daylight from out front of his brothers warehouse. He'd held out hope that the cops would find the car in a few days and everything would be recovered. 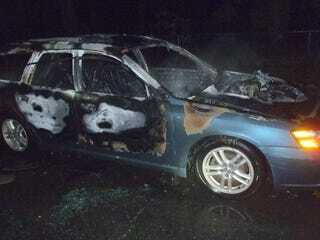 This morning, they found the car, torched, totaled and dumped in an industrial area. There was also reports that a similar car was used in a shooting earlier that night. Rest in Peace 05 Legacy Wagon...you will be missed.